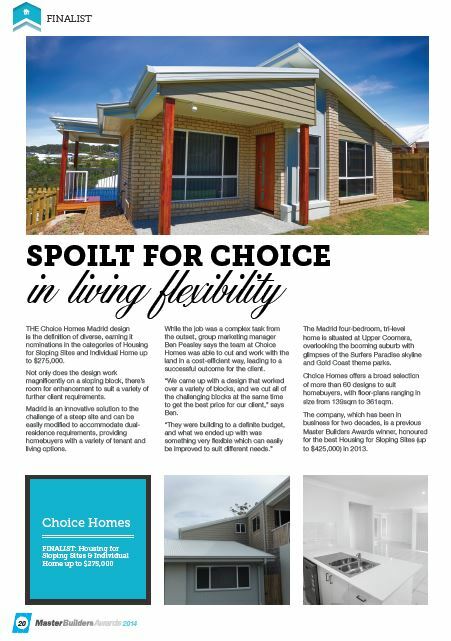 The Choice Homes Madrid design is the definition of diverse, earning it nominations in the categories of Housing for Sloping Sites and Individual Home up to $275,000. Not only does the design work magnificently on a sloping block, there’s room for enhancement to suit a variety of further client requirements. Madrid is an innovative solution to the challenge of a steep site and can be easily modified to accommodate dual residence requirements, providing homebuyers with a variety of tenant and living options. While the job was a complex task from the outset, group marketing manager Ben Peasley says the team at Choice Homes was able to cut and work with the land in a cost-efficient way, leading to a successful outcome for the client. “We came up with a design that worked over a variety of blocks, and we cut all of the challenging blocks at the same time to get the best price for our client,” says Ben. The Madrid four-bedroom, tri-level home is situated at Upper Coomera, overlooking the booming suburb with glimpses of the Surfers Paradise skyline and Gold Coast theme parks. Choice Homes offers a broad selection of more than 60 designs to suit homebuyers, with floor-plans ranging in size from 139sqm to 361sqm. The company, which has been in business for two decades, is a previous Master Builders Awards winner, honoured for the best Housing for Sloping Sites (up to $425,000) in 2013.